There is nothing greater than a hot, freshly prepared cup of espresso using the freshest beans and a high-quality machine. You’re sitting there thinking, but how much does the machine really matter? So, here’s the full disclosure. The most important aspect of making good espresso is the grinder. Once you have a good grinder, you’ll need some good beans and an outstanding machine. This is a pump-driven espresso machine that provides the right amount of pressure for every extraction. The frother makes the task of making foam easy and mess-free. Programmable menu settings make this machine capable of pouring the perfect cup every time. An integrated grinder means you’ll get perfectly ground and fresh beans every time. System is compact and easy to clean with completely removable components. Requires a regular maintenance routine that takes about 10 minutes a week to keep in running in top condition. Machine self-tamps the coffee, which makes this a less-than-ideal solution if you want more manual control. It’s a super-automatic machine, which means you won’t have complete control over all elements of the espresso-making process. Leans on the expensive side for a “home-build” espresso machine, but the machine has outstanding longevity. 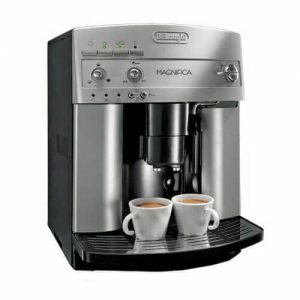 This machine is designed for busy people who want outstanding coffee shop-quality espresso in their home. It’s a no-fuss, reliable and powerful machine you’ll love. I used to work in a very well-known coffee shop when I was putting myself through school. During that time, I had the chance to use several different professional-level espresso machines. On a lark, one day I bought a base-level DeLonghi espresso machine that only cost $100. 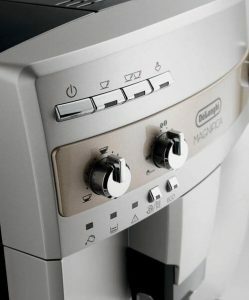 It was the best machine I ever purchased, and it made me a DeLonghi fan for life. 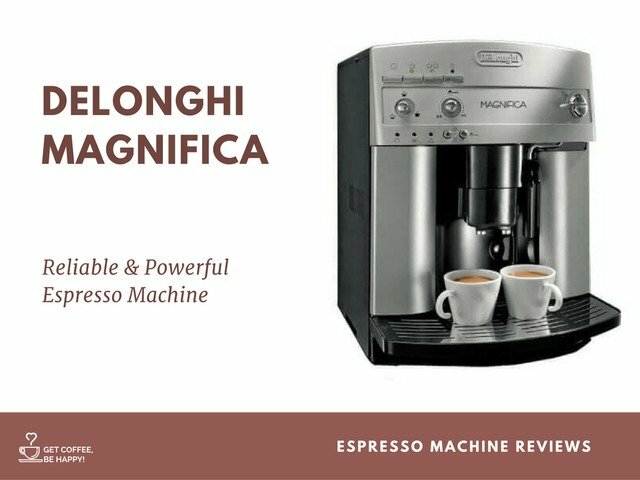 The DeLonghi Magnifica is one of those machines that is so easy to use, you’ll wonder why you spent so much time and money waiting in line for your coffee at your local, overpriced coffee shop. One of the biggest deterrents to using an espresso machine is learning how to use it. With a super-automatic, everything is done for you. It grinds, tamps, extracts and ensures you get the perfect espresso every time. Those who know coffee know that the grinder is the most important part of your espresso-making arsenal. 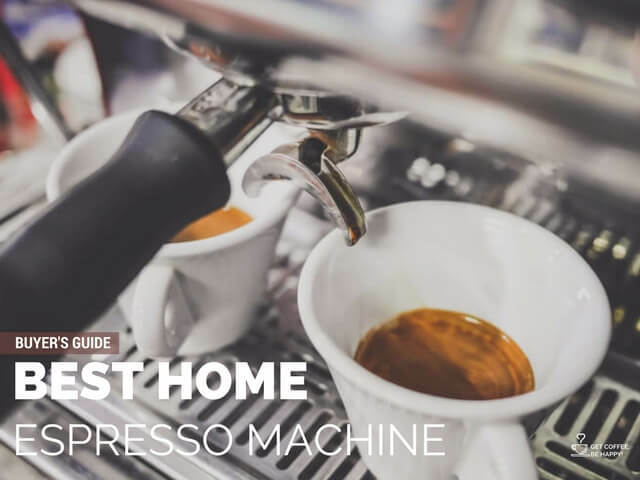 This machine uses a conical burr grinder that gives you perfectly ground espresso and doesn’t “slice and dice” your grounds into a pulp like other built-in grinders. Best of all, everything on this machine is automated. Push-button control may be frowned upon by some espresso connoisseurs, but there just isn’t time for tamping and stamping when you have a life to live. Novel Cappuccino System: getting the right amount of foam can be tough, but this machine uses steam in an intelligent way to create a rich, foamy froth that will leave you mesmerized. Water Spout: need hot water? Use the hot water spout to make the perfect Americano, tea or hot chocolate. Automatic Shut-Off: the machine saves power and automatically shuts down after three hours of inactivity. Control Panel: get a custom brew with the easy to use control panel designed to save you time and make perfect espresso. Dual Thermoblock: dual thermoblock enables you to get the perfect temperature for steaming milk and making espresso to prevent burning and over-extraction of your espresso. Auto Adjust: the machine auto adjusts to grind the right amount of coffee for one or two shots of espresso. Adjustable Coffee Spout: made for more than your typical shot glass, you can place large cups directly under the brew head with the adjustable coffee spout. Optimal Pump Pressure: achieve optimal pressure using the 15-bar pump that produces the right amount of water pressure for an even and smooth extraction. Instant Reheat: machine reaches an optimal temperature quickly with the instant reheat option. If you’re looking for a professional-quality machine that will keep up with morning shots for the entire family or a small gathering, this machine is one of the best deals available on the market. It’s smart, stylish and sleek. It performs many of the time-consuming tasks for you, and you’ll be able to get the most out of your coffee-brewing experience when you use this machine. In the world of super-automatic espresso machines, there is always at least one bottleneck that decreases the value of the machine. This machine will keep up with you, and it has the high-quality components you need for brewing serious espresso, lattes and cappuccinos.